I thought I’d write a brief blog on this subject as I could not find any info out there on the net about this particular, narrow time period and this little oddity. It’s only a little thing, don’t expect it to be groundbreaking, but all the info we can acquire on these valuable pickups will prove useful for everyone. Pickups pictured above are from a mid 1957, very nice, all original Gibson ES-350T and they are pre sticker PAF’s with stainless steel covers. 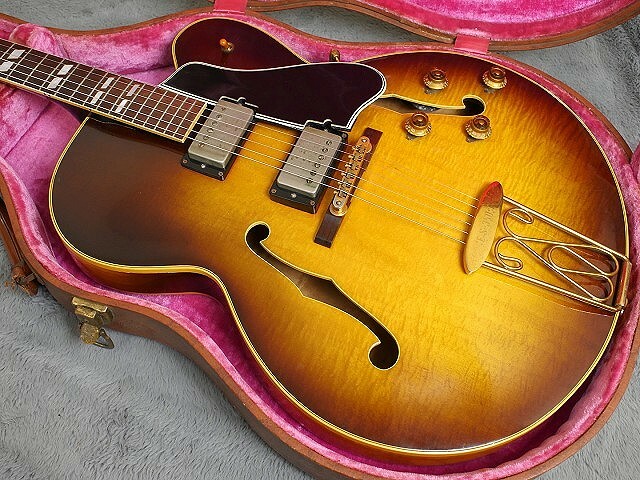 The seller who sold this guitar to me originally thought they were ‘replacement pickups of unknown origin’ and yes, they do look a bit odd and nothing like the PAF’s you usually see, including the pre-sticker, original 1957 PAF’s you usually get in Les Paul Goldtops. However, this guitar had pots sealed in cans and not a single solder joint disturbed anywhere so the likelihood of these being replacement pickups was slim so after a bit of digging around it became apparent that these are without a doubt, totally original (and still sealed) pre sticker Patent Applied For pickups. So why the funky looking base plate? If you look closely you will see the two rows of holes for the 6 pole piece screws do not line up. 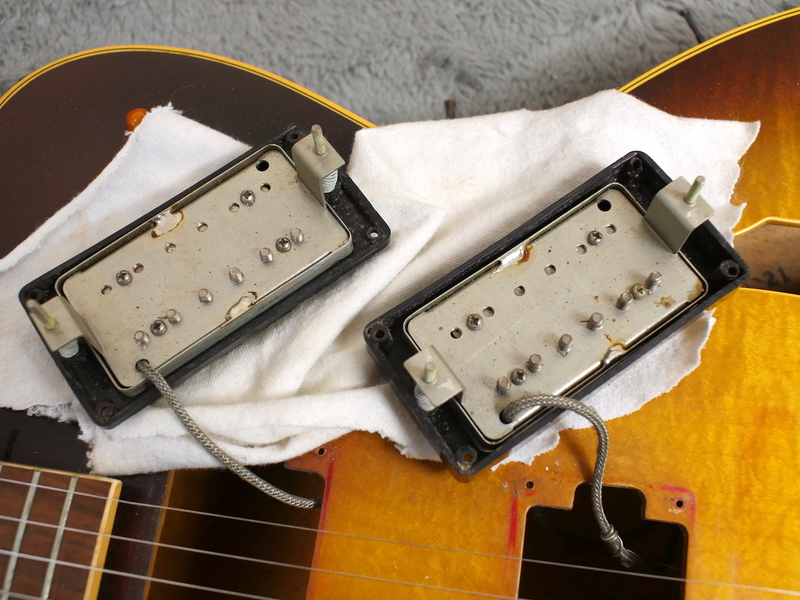 The reason being these pickups are from an ES-350 which is a short scale Gibson that like the later Byrdland, had short spaced pole pieces so the strings correctly positioned themselves above the pole pieces. Had they used standard spacing they would have been out of alignment. 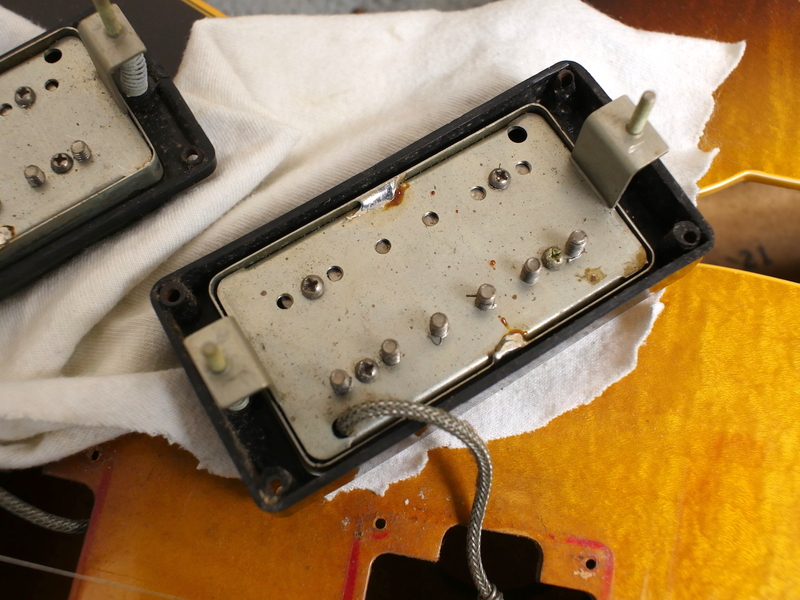 You can also see how Gibson made the baseplate for these unusual PAF pickups. Instead of having special ones made, it seems whenever they wanted to make some unusual spaced PAF’s they just grabbed a few of their normal spaced base plates (which they probably had thousands of), rotated them by 180 degrees and re-stamped or drilled the holes on the slug side. I believe they also did this for the few tenor guitars they made with PAF’s too. Since I posted these pictures on my Instagram account a few people have left comments confirming this and one even commented he had seen these base plates on an early black plastic 57 LP Goldtop.